I have mixed emotions on the title of today’s blog post. 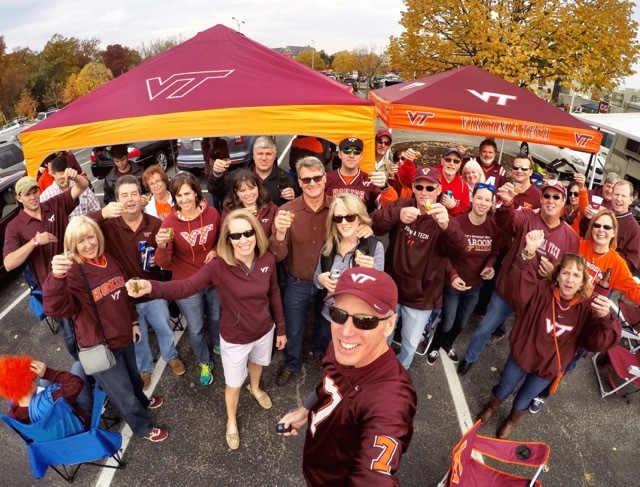 As season ticket holders of Virginia Tech football, our falls are always filled with fun – and a lot of driving. This year, though, our Hokies are either under-performing or just not that good. And I’ve got to admit that it’s a lot harder to make that four-hour drive to watch our team lose. Backing up to Monday, my friend Tracy came to my house for a run on the trails behind our houses. I’m temporarily car-less, so she agreed to meet me at my house. I mean, God forbid I actually walk a relaxing mile to her house for our run! We had a delightful late morning run, and spent a little time doing some GoPro strides just before we turned around on our out-and-back run. On Tuesday, I ran ten timed fartleks with a 1.5-mile warm-up and 1.5-mile cool-down. Since I’m between training cycles I thought this would be a great way to keep my speed up without an intense speed workout. 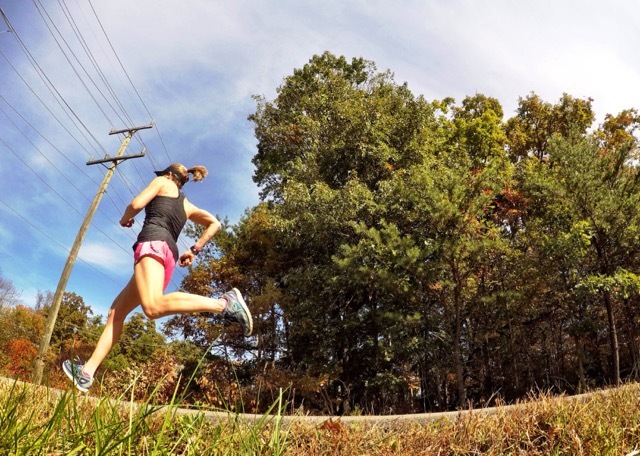 I recently joined a Facebook group where the #runabler leader Heidi gives us a weekly speed session to do, should we choose. As a running coach it’s nice to not think, and follow someone else’s plan. On Wednesday, I gave my legs a rest from running, but started my off-season lifting. Now that my legs have had a chance to recover from Ragnar and I don’t have any big (read long) races coming up, I’m upping the lifting with my legs. 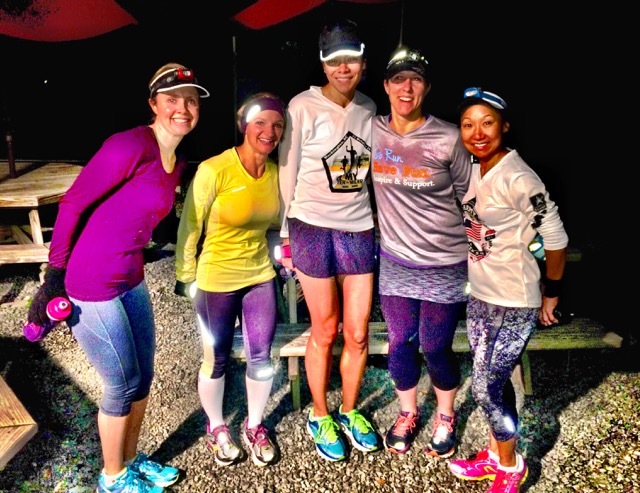 Thursday morning I met my early-morning MRTT friends at 5:30 AM for the first time since Labor Day. Both Tiffany and Lupe would be running Sunday’s Marine Corps Marathon, and I wanted to give them a proper send-off! Tracy would be running the Marine Corps 10K and cheering on our friends after her race. We did an easy five miles, and it was great getting my run finished so early in the day again. Feeling very European, I walked to a few stores to complete some errands while car-less. Even though I have several stores to choose from only a mile from my house, I almost always drive because of time and hauling the stuff home. This week I will most likely spend another week car-less since my Cruisermobile is getting a new transmission. I call my large SUV the Cruisermobile since it’s hauled a lot of Cruisers (and later MRTT friends) to-and-from races! After riding in the car for several hours on Friday, my leg was bothering me on Saturday morning so I opted to sleep in. Sitting in a car is the toughest thing on my back, which results in sciatic nerve pain in my right leg. Being more ambitious than me, Bill hopped on the hotel bike and then took a short walk on the Huckleberry Trail before we headed over to our tailgate. My friend Lynn, and fellow MRTT’er, and I just might have recruited another lady to join our chapter. Laura and I started talking about running and then triathlons (she’s completed several). 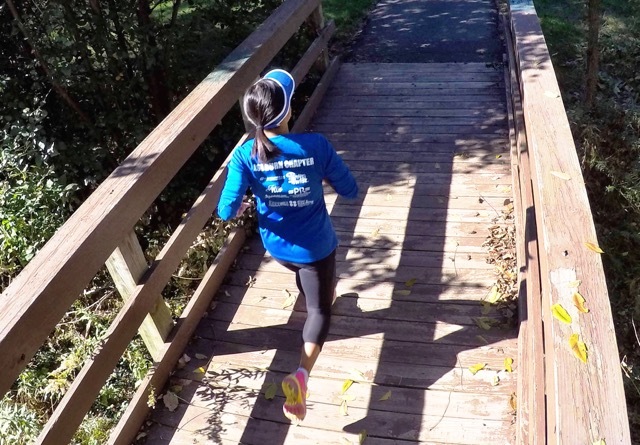 Laura was a collegiate swimmer, but would like to become a stronger runner. I couldn’t let an opportunity pass us up, and suggested she join in on our chapter fun! I also learned that Lynn is going to be one of our volunteers at our April Ragnar Trail Relay in Richmond. We have so many fun ladies heading to Richmond, that I just know it’s going to be a blast! Keeping with our tailgate tradition, we toasted the Hokies with a tequila shot before heading into Lane Stadium. 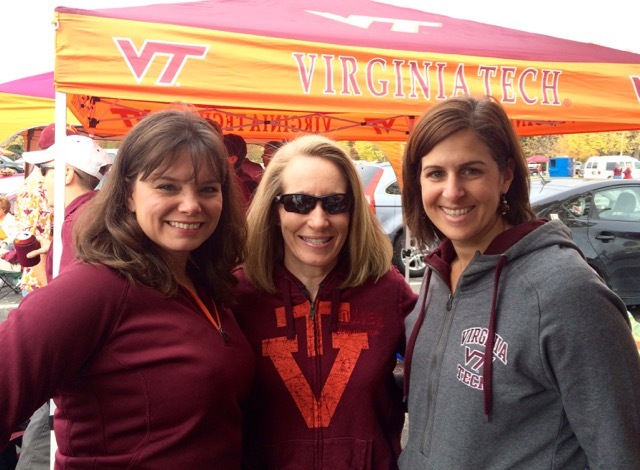 The Hokies may have lost the game in quadruple over-time, but we’ve never lost a tailgate! 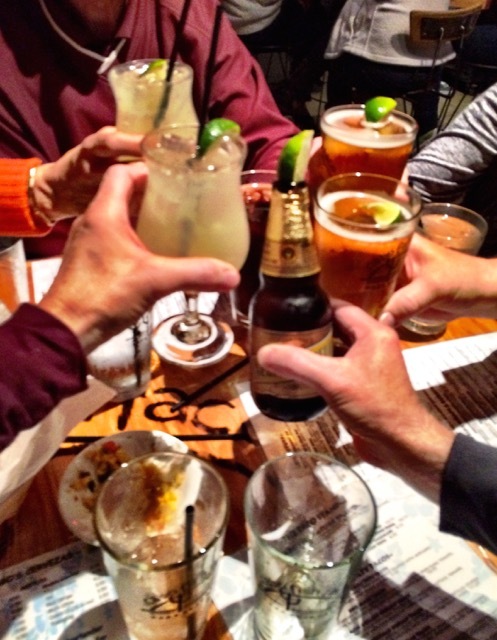 After the game we headed to Cabo Fish Taco for drinks and dinner. The garlic lemon grilled shrimp tacos with cilantro sauce were ah-mazing! Your tailgating looks like fun! Very cool that you met another Ragnar person! I did race this weekend – cyclocross though, so I am training through these and basically treating them like workouts. Which is good, because I can push myself harder in these events than I can on my bike trainer indoors (which soon will be my only option when the weather is crummy). Mentioning training on your bike trainer reminds me that I’m sure I’ll need to get a few runs in on my treadmill this winter. Thankful to have it as an option, though. The tailgating looks like such a fun tradition but I can definitely relate to overbooking weekends. I do enjoy gardening but that is one thing that suffered during marathon training and now with this foot injury. My hips get cranky after sitting too long in a car, or sitting too long anywhere really. How wonderful you found a new recruit. Thanks for linking with us! We have been tailgating with our group of friends for many years. We’ve been friends with some of them since freshman year! My hip used to bother me all of the time and I just assumed it was hereditary since my dad had a hip replacement; however, once I switched out an exercise that I was doing and subbed in some other ones, it’s been fine. Turns out, I was overworking it. Thanks for providing the linkup! Looks like yall had a great time tailgating! The toasted tequila shot sounds great too! Ha. I would so try the garlic lemon shrimp tacos too. I hope Meagan enjoys the tickets! I did enjoy dressing up for a Halloween themed 5k this past weekend. Appreciate you Deb, for linking up with us this week. We do know how to throw a great tailgate, and always have so much fun! Looks like a fun wkend! I love fish tacos. So yummy! This wkend was my tussey mountain race. Good times! Is the Tussey Mountain race the one in Pennsylvania? If so, my friend has run the 50-miler several times. He loves it! I’m still loving your GoPro pics! Looks like a fun weekend! Those shrimp tacos sound delicious! I really need to try making shrimp tacos – can’t believe I haven’t. They were so yummy! No racing for me this weekend….I have total MCM envy too-I should have signed up for the 10k. Weekend spent at son’s soccer game, hike up Sugarloaf Mt with the kids and Sunday lazy day. Good job on lifting in the off season-that is my plan too. Sounds like you had a fun weekend, too! You all look like professional tailgators! I love college football (I am a Florida Gator) but I only go to a game every once in awhile- it is a ton of fun though! Enjoy your extra week being car-less, the extra walking around might be nice! Gardening is one of my favorites, I am just waiting for a little more consistent weather, still pretty warm here 🙂 Have a great week! Mary Beth Jackson recently posted…Hunting Widow Week 2! I had to reschedule a dental appointment this week since I don’t have my car. I didn’t feel like walking ten miles (one way) to my dentist office, and didn’t feel like paying for Uber! HaHa! Thank you for selling us your UNC tickets! Lets hope my winning streak with the Hokies continues. I’m still not over the Duke game. I think we would have won if we hadn’t had that clock management error (thinking it had stopped when it hadn’t) right at the end of the 4th quarter. Actually, I’m kind of kicking myself for selling our tickets now that that’s going to be Beamer’s final game. :p If Metallica shows up (or something equally cool), you’ll have to facetime me so we can enjoy it together! HaHaHa!